Housebreaking Jack Russell Terriers is known to be a difficult process, but a few simple tips and techniques can help make the transition a lot smoother when you bring a new dog into your home. Remember, housebreaking is not just about toilet training - it's about teaching your dog what is and isn't acceptable in the human world. Dogs, and Jack Russells in particular, have a nature that is often not very well in line with behavior expectations in human society. They need to be taught, from puppyhood, how to behave as we want. Puppy toilet training is one of the most important parts of the housebreaking process because it's the one that can have the biggest negative impact on your life and your home. Stains and puppy accidents can ruin a carpet unless washed out thoroughly. You want to get this problem handled as quickly as possible. You need to take a new puppy outside on a regular basis - in particular, after meals and drinks, and before and after sleeping times. These are the times when the pup is most likely to need to go. Read more about housetraining puppies. Remember, never punish a dog for an accident. Punishing this kind of behavior will only make it worse, especially if it's a new puppy. 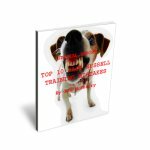 If your dog is consistently having toilet training problems, my ebook, The Jack Russell Lover's Ultimate Guide To Training contains full explanations of the possible causes and how to treat the problem. As I said, housebreaking Jack Russells is about more than toileting training - it's literally the whole process of teaching your dog how to live in a house. That extends to teaching a dog not to chew up clothes, couches, and shoes, and not to steal or beg for food. Learn how to stop your puppy biting and stop puppies from chewing on things they shouldn't be touching. You may also want to teach your dog the "Leave It" and "Drop It" commands, which you can find basic explanations of in this page about basic dog commands. You can get a more in-depth explanation of these and plenty of other useful commands in my ebook. if you're cleaning up stains every five minutes, but look at it from a different perspective. You're helping your dog to learn and grow. Of course there are going to be accidents along the way - how many of us learned to ride a bike without taking a few grazes on the knee along the way? Enjoy the ride. Don't focus too much on the end goal - just appreciate each little improvement. Pretty soon those small improvements will mount up into a more obedient, sociable dog who's a joy to have around. And remember, JRT owners don't own JRTs because they want a boring dog. We own Jack Russells because they have character. Sometimes they are cheeky, sometimes they do the wrong thing - and they know it. This is a battle of wits. Learn to love it. Still battling with toilet training troubles? Chances are, you need some more advanced tips and a whole new approach to training. My complete guide to Jack Russell training includes troubleshooting tips for hard-to-housebreak Jack Russells.